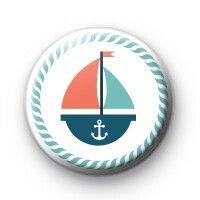 Fun 1 inch Pirate Ship pin badge. Our handmade badges are great for party favours and to add to your fancy dress outfit. This Pirate / Nautical themed one is bright and fun especially if you love to sail or have a soft spot for boats and all things beach related.